This blog posting is long over due. In fact it’s since April 2014 over due, because that’s when this event occurred. 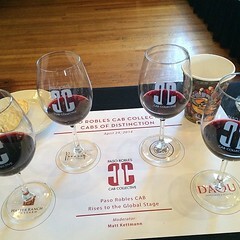 I have already written a couple blogs on the Cab Collective but the Cabs of Distinction event is my current favorite. It was a collaboration between the acclaimed SOMM Journal, Parker Sanpei, and the Paso Robles CAB (Cabernet and Bordeaux) Collective (PRCC) it was 4 days (I was only able to attend 3 of the days) long and included a “camp” for Sommeliers and Press with the entire event culminating in a Gala tasting for the public. 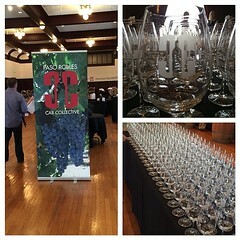 The first 2 days took place at the ballroom of the Paso Robles Inn, and 28 wineries were present. In trying to determine how to write this blog post I have written and rewritten it several times because there is so much fabulous stuff to cover,and even though this is still going to be a bit long, writing a book isn’t an option. After much time and thought I think the best way to do it, is to write a general post about my experience and make a list of all the participating wineries at the end. Then follow it up with a more in depth post about the panel discussion, and do an individual post on a few of the great wineries that we tasted, monthly until this event comes around again. Day 1 consisted of the En Primeur tasting and the current Vintage tasting. An important point to note is that all, if not most of the En Primeur wines in the tasting had been aged around 6 months by this point, and had been pulled from the barrel either that day or within a couple days of the tasting. That being said all of these wines were still very young and several were still in bottle-shock, but it gave us a great idea of how the wines were going to taste once they’d aged and were ready for retail sale. 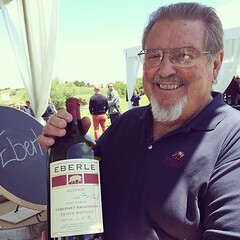 Since the event was split up, the En Primeur tasting started at 3:30 p.m. and then the Current Vintage at 5:30 p.m., which consisted of tasting all the wines that could presently be found on the shelves in your local market. Many of the wineries still had wines on the table from the En Primeur tasting, so it was really fun to be able to taste those next to some of the current wines that are readily available. It showed a very sharp contrast between what was up and coming, and what’s had some aging time and was now bottled and ready to drink. 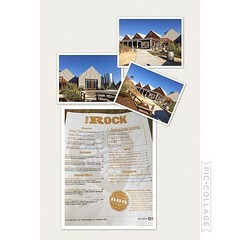 After the tastings we had a choice of winemaker dinner events at various restaurants. We opted for the Adelaida Cellars winery dinner being held at Bistro Laurent a charming French bistro in Paso Robles, and hosted by Winemaker Jeremy Weintraub and Adelaida’s National Sales Manager Paul Sowerby. Unfortunately we were unaware due to a miscommunication that we were supposed to make a reservation to be included that evening…Whoops! Even though there was a glitch, and we were unable to sit at the Adelaida table for the dinner, we opted to stay and order the prixe fix dinner meant to pair with the wines Adelaida had brought. Paul, knowing the situation did his very best to include us in the tastings by bringing over the paired bottles during each course to share with us. Boy howdy did he bring over some VERY cool Library wines. 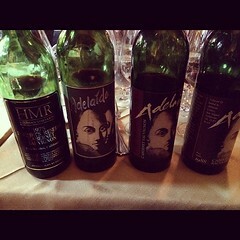 There were wines from 1975, 1982,1985 and 1988 but, more on that in a later blog…spoiler alert my favorite was the 1982. 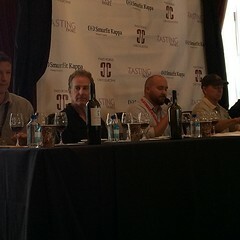 Day 2 was the panel discussion and the Library, Rare and Reserve tasting. The panel was moderated by Matt Kettman the contributing editor for Wine Enthusiast as well as being senior editor of The Santa Barbara Independent and consisted of some of the most talented wine makers in the county: Michael Mooney of Chateau Margene, Daniel Daou of Daou Vineyards, Kevin Sass of Halter Ranch and David Parrish of Parrish Family Vineyard. The panel also included a tasting of a specifically chosen Cab from each winery, so each winemaker could discuss their process and the result. There was a lot of discussion about “clones”. The best way to describe them is, they are variations within the varietals that essentially are created by cutting off a preferred portion of the vine, creating a genetically identical second plant that will then, create a desired mutation. Starting with Chateau Margene’s 2012 Cask 4 Cabernet Sauvignon, Michael explained that it was aged in 100% French oak and 50% of the grapes in the Cab were clone 8. The wine was 50% Estate grapes and 50% came from 2 other vineyards. During fermentation the wine was inoculated with native yeast to create different aromatics. It was young and fresh, with vibrant plush, soft, tannins. It had been bottled March 4, 2014 and retails for about $96. Daniel Daou presented us with his 2010 Soul of a Lion Cabernet Sauvignon (already sold out). It came from the mountain estate’s 3-year-old vines, and spent 24 months in 100% French oak. The wine itself was spicy with hints of licorice and had a dark red color, it was well-balanced with a natural acidity, and a long tannic finish. With Halter Ranch’s offering, Kevin had us try their flagship wine the 2010 Ancestor. This wine took a very long time (about 2 hours) to open up. Which is probably why they say it’s not really a “by the glass” wine, but it did soften as it gradually opened. Even though he was the 3rd to speak, and the wines were poured about a 1/2 hour prior to the panel, it still hadn’t opened up completely by the time we got to tasting it. The wine was a Bordeaux blend of 39% Cabernet Sauvignon from Block 27, 35% Petit Verdot from Block 23, and 26% Malbec from Block 42. It was then blended and aged 16 months in new French oak. There were about 900 cases made and it should age beautifully in the bottle for the next 10-15 years. Lastly we heard from David who discussed his 100% Estate grown 2010 Cabernet Sauvignon. The wine was made of 3 different clones: the #6, #337 which produces black fruit, and the #4 clone, which imparts more earthy tones to the finished product. The wine had a great tannin structure and a pretty strawberry nose; while the palate brought in spice and earth, with black fruits and hints of tobacco. 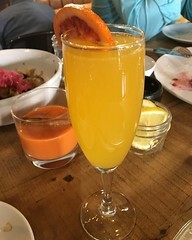 It had a nice luxurious mouth feel and a long finish. They aged the wine for 22 months in 60% New French Oak, and 40% Neutral French Oak barrels. There was only 225 cases of this wine produced. Besides a VERY educational panel discussion, the second day also included a winemaker lunch and the Library, Rare and Reserve tasting. 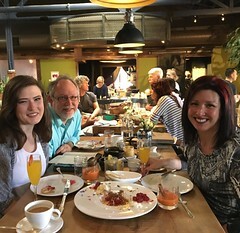 There was a list of winemakers who were offering luncheons and I chose to go to the one hosted by David (winemaker) and Cecily (GM) Parrish. Initially the luncheon was supposed to take place at Thomas Hill Organics but due to a mix-up we ended up at Artisan. 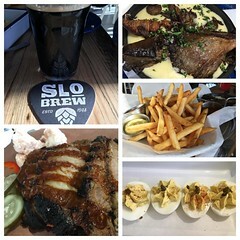 Since it was a last minute change we just ordered a few dishes off the menu and did a pass around family style. David was a wonderful host and his wines paired very well with the dishes. During lunch he told us all about the winery and vineyard and was very charming. On the way back to the hotel we stopped by the winery since it was literally around the corner, did a quick tasting and bought a couple of bottles. When we got back we went directly into the Library, Rare and Reserve tasting. It was really exciting to taste some of the older more unique wines most of which aren’t even available anymore. 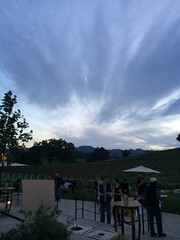 While we were walking around doing our tastings we stopped by the Justin Vineyards and winery table, where we were invited to an after event dinner. We arrived at Justin and the evening and view was simply stunning. 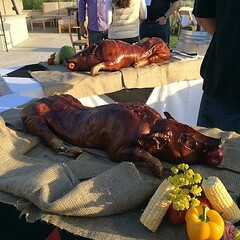 They had 2 whole roasted hogs for dinner with all the fixin’s. We were lucky to be able to sit with the winemaker Scott Shirley who talked to us about the different wines we were drinking, and introduced me to a gorgeous glass of their signature (Reserve) Isosceles that was hidden away (so I don’t know what the vintage year was) and required the “secret winemaker password” to get some. We had a great time comparing the “regular” 2011 Isosceles to the Reserve. The other awesome part of coming to this after party, was that all the participating wineries brought their open bottles of wines that weren’t finished during the tasting and what a selection it was! 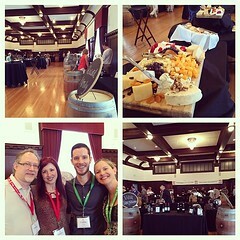 The final day was the Gala Tasting at the River Oaks Hot Springs in Paso Robles. This was a very fun and interesting event. There were Coopers making barrels and explaining to interested on lookers what they were doing. They did a demonstration on how they toasted the barrels and what effect each type of toasting had on the wine. The organizers had put Charcuterie on each table to pair with the wines each winery was offering. Although there were a lot of people, the reps/wine makers/winery owners, were all very patient and informative when talking about their wineries and each wine they were offering. 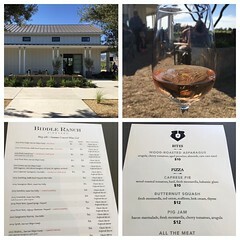 The day was perfect, the event was terrific, the wine was fantastic and I definitely highly recommend it if you have an opportunity to go. Adelaida Cellars, Ancient Peaks Winery, B&E Vineyard, Bon Niche Cellars, Calcareous Vineyard, Cass Vineyard & Winery, Chateau Margene, Clautiere Vineyard, Clos Solene Winery, Daou Vineyards and Winery, Eberle Winery, Falcone Family Vineyards, Halter Ranch Vineyard, Hammersky Vineyards, Hunt Cellars, J.Lohr Vineyards & Wines, Jada Vineyards, Justin Vineyards & Winery, L’Aventure Winery, Le Cuvier Winery, Le Vigne Winery, Opolo Vineyards, Parrish Family Vineyard, Peachy Canyon Winery, Pomar Junction Vineyard & Winery, Record Family Wines, Red Soles Winery, Robert Hall Winery, Sextant Wines, The Farm Winery, Villa San-Juliette Vineyard & Winery, Vina Robles Winery.